Thanks so much for stopping by & have a wonderful weekend! this is awesome in the mostly white...hope you have a fabulous weekend! Such a beautiful card you have created I love the white on white. Thank you for sharing with us at Lady Anne's. I hope we see you again. I love all white cards, Jackie! Thanks so much for playing along with us at the Simon Says Stamp snowflake challenge this week! This is SO PRETTY Jackie! And I love that you did the sentiment panel in red ... looks awesome! Embossing on white is just absolute elegance in my book. Love this pretty card. Pretty! The white on white was done well by you!!! I especially like the sentiment font and how it is laid out. Great card! Jackie, this is sooooo elegant!! Wow, this is a stunning and elegant card! Your cards are always so pretty but this one is gorgeous! This is so pretty!!! I always love the white on white look. The embossing is incredible and really makes it pop. Great job. Oh wow this is gorgeous. I've never been good with white on white, but this is a major inspiration! And the red text was a great idea! Very pretty card. Thanks for playing with us at Twisted Tuesday Challenges. LOVE this! 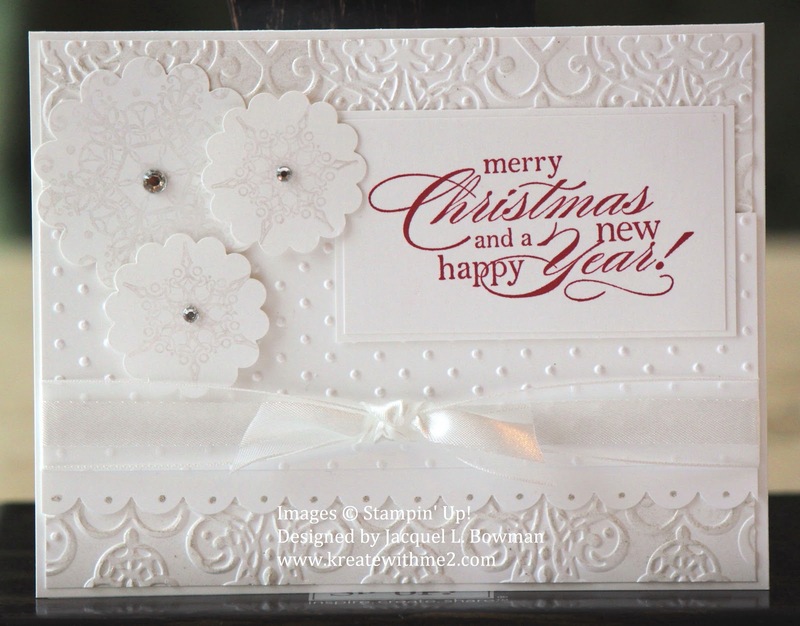 the snowflakes on the scallop circles look great...and that pop of read is so festive! Really beautiful card, Jackie! 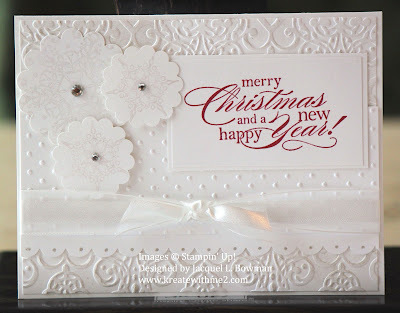 So glad that you shared it with us in our Let It Snow challenge at Perfect Sentiment. Hope you'll be joining us again next challenge. Very pretty white on white card!Thanks for joining the party at TT! Very elegant! Love the white on white and the bit of red really looks wonderful! Beautiful card Jackie! I love white on white... there's nothing more classy and elegant than that.